Feeling the inspiration of St. Patrick’s Day? Try these three corned beef recipes that will have you feeling the lure of the Emerald Isle all year round. Place the rye bread on a clean surface. Spread Dijon mustard evenly on each slice. Lay a slice of Swiss cheese on the mustard. 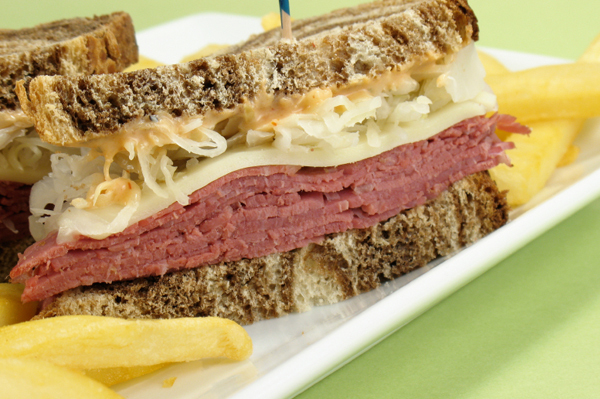 Layer the corned beef over the cheese on one slice of bread. Spread the sauerkraut over the cheese on the other slice of bread. Put both bread halves together, then butter the outsides. Grill or fry over medium heat until golden brown and the cheese has melted. Serve with a side of plain mustard or Thousand Island-type dressing for dipping. Add the red peppers and onions, then cook until tender. Add the chicken stock, corned beef and potatoes. Stir, reduce heat to medium low and then cook until liquid has evaporated. Divide among four serving plates. Poach eggs in an egg poacher or fry in a skillet over medium heat. Cook until the egg whites are cooked but the yolks are still runny. Place an egg on top of the corned beef hash on each serving plate. Season with salt, pepper and parsley; then serve. In a large saucepan over medium heat, saute the carrots, parsnips and onion until almost tender. Add the stock, beer and water and bring to a boil. Stir in the potatoes, corned beef cubes and chopped cabbage; then reduce the heat to medium and simmer for 20 more minutes. Salt and pepper to taste and serve with Irish soda bread.